Business Objects is a combined query, reporting and analysis solution for business experts which allow them to access the data in their corporate databases directly from their desktop and present and analyze this info in a Business Objects document. Business Object is an OLAP tool that is generally used by high-level management as a part of a Decision Support Systems (DSS). BO makes it easy to access the data because you work with it in business terms that are familiar to you, not technical database terms like SQL. 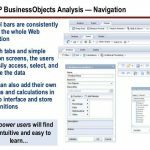 Again, SAP Business Objects Analysis, edition for OLAP is a powerful, web-based OLAP analysis tool that helps you gain insight into business data and make intelligent decisions that impact corporate performance. 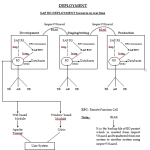 What’s new in Analysis, edition for OLAP? Support for additional data sources. 1) Data warehousing/dimensional modeling practical concepts. 2) Database concepts needed for data warehousing. 13) Universe builder & query builder. 14) Query as web service. 17) Import wizard publishing wizard. 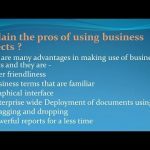 22) How to use & leverage bo extension points in business objects. 23) Bo Xi r3 certification guidelines. 24) Intelligence xi 3.0 – level one.